I’m loving @CARICOMClimate’s live coverage of #ICCS3 — whoever you are, come find me and I’ll raise a drink to ya! The third International Conference on Climate Services (ICCS3) is underway (Dec 4-6) in Montego Bay, Jamaica. ICCS3 seeks to address current progress, challenges and opportunities in climate services implementation, and foster discussions regarding the transition from pilot activities to sustained services. Climate services refers to the provision of climate information that supports decision making. Such information services play a crucial role in national development planning for managing development opportunities and risks and for mitigation and adaptation. Dr Ulric Trotz, Deputy Director and Science Advisor at the 5Cs, says this first of its kind event in the Caribbean and any developing country is an opportunity to find linkages between international climate services and those in the region. Climate services are crucial as climate variability and change are posing significant challenges to societies worldwide. Therefore, timely communication of climate information helps prevent the economic setbacks and humanitarian disasters that can result from climate extremes and long term climate change. However, efficient application of climate services requires that climate information be integrated into various sectors’ policies. The 5Cs Science Officer Mr Ottis Joslyn notes that the need for such cross-sectoral approaches is one region the Centre’s seminal risk management tool, the Caribbean Climate Online Risk and Adaptation TooL (CCORAL), is being prominently featured at ICCS3. Mr Joslyn and Keith Nichols, Programme Development Specialist at the 5Cs, will lead a special training on this tool on Thursday, December 5 at 4:30pm. The 5Cs is currently supporting a series of national consultations across the Caribbean under the Global Framework for Climate Services (GFCS), which was established in 2009 at the World Climate Conference-3 (WCC3). WCC3 was organized by the World Meteorological Organization (WMO) in collaboration with other United Nations (UN) agencies, governments and partners to steer the development of climate services worldwide. This conference is of great importance for developing countries and for Small Island Developing States (SIDS) in particular. It is common knowledge that we are among the most vulnerable to the impacts of climate change, but what this conference will provide, is an opportunity to build our capacity, and to look beyond weather and hydrological information, to a focus on climate information for decision-making. “Firstly, we know that everyone is affected by climate – particularly its extremes, which cause loss of lives and livelihoods all over the world, but overwhelmingly in developing countries. Secondly, we know that – where they exist – needs-based climate services are extremely effective in helping communities, businesses, organizations and governments to manage the risks and take advant age of the opportunities associated with the climate. The identified climate change impacts, multiplicity of stressors, and the available scientific information all suggest that the Caribbean region is a climate change hotspot. This presents a clear need at the national level and as a concerned region, for climate services that will help families, businesses, and communities to make informed decisions. The Caribbean Community Climate Change Centre has noted that “Over the last decade alone, damage from intense climatic conditions has cost the Caribbean region, including Jamaica, in excess of half a trillion US dollars. This is because countries like Jamaica rely heavily on climate sensitive socio-economic activities such as agriculture, fisheries and tourism”. It is anticipated that the provision of climate services will generate information on how we can adapt to expected future temperature and precipitation variability, changes in the sea level, modifications to growing seasons, and the potential impacts of a changing climate on our natural and built environments, particularly in relation to our business and public sectors such as agriculture, energy, tourism, transportation, public health and national security. Climate services information will enable our coastal communities that are increasingly vulnerable to storm surge and the anticipated sea level rise, to meet the challenge and appropriately site critical infrastructure such as hospitals, schools, power plants, airports and roads. We are increasing the applications of weather and climate information services in the agricultural sector, to increase and sustain our agricultural productivity. In doing so, we are targeting both small and large scale farmers. This initiative is facilitated by the Caribbean Agro-Meteorological Initiative (CAMI), through funding from the European Union’s ACP Science and Technology Programme, and in partnership with the Caribbean Institute for Meteorology and Hydrology (CIMH); the World Meteorological Organization (WMO); and the Caribbean Agricultural Research and Development Institute (CARDI). We are also improving our Climate Predictability Tool developed by the International Research Institute (IRI) to produce a seasonal forecast for precipitation and temperatures. There is a clear need to promote integrated service delivery and stimulate the development of environmental technologies, applications and services in the private sector. The provision of inundation mapping services, to inform decisions on sea level rise and storm activity, are critical and are urgently needed. The assistance to our farmers through modelling will help them to adapt to the changing climate through services such as drought forecasting, precipitation modelling as well as vulnerability and risk mapping. Developing countries, in particular, will be looking at the products that will inform our health sector managers in responding to heat projections and the potential changes required in health services; as well as those that will inform our business leaders and national governments in investment decisions and planning. Pioneering climate services will enable us to make smart decisions to ensure public safety, increase our resilience, drive smart public and private sector-led infrastructural investment and stimulate economic growth. That’s a wrap for excerpts from the Minister’s speech. Good morning and welcome to our second day of live coverage of ICCS3. Guy Brasseur of the Climate Service Center in Hamburg, Germany and National Center for Atmospheric Research in Boulder, CO kick-off today’s discussion with a A Dynamic Vision for Climate Services Partnership (CSP). 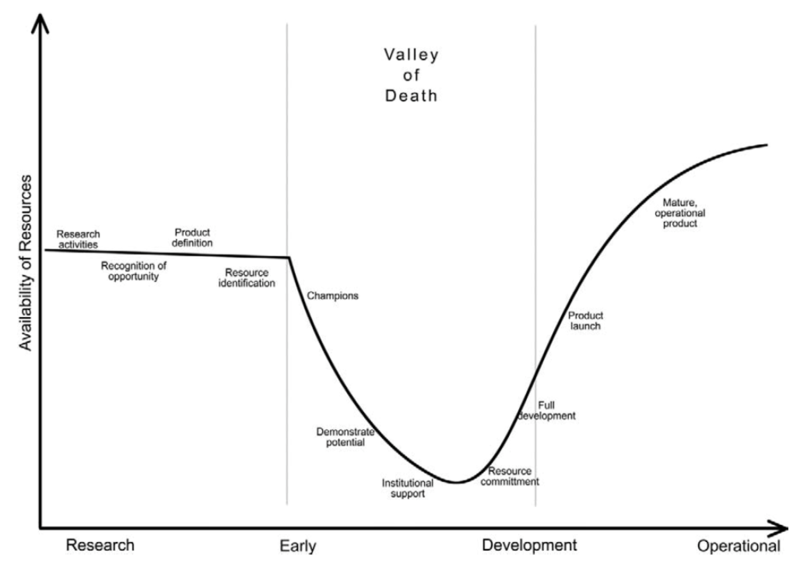 Brasseur says finding champions, demonstrating potential, establishing institutional support and resource commitment constitute the Valley of Death (Barr et al. 2009) in the process of developing CSP. Below is a chart he shared that illustrates this thinking. •The concept of climate service is new and largely unexplored. •The national and international landscapes are complex with different competing institutions at different levels. •To be credible, Climate Services must be neutral and independent from political and financial pressures. •The scientific community is not yet sufficiently engaged. •Until today, many customers do not know which services and products they need. •The functions of CSC include aspects that clearly belong to a public service, while others are primarily market-oriented tasks. Here’s a quick summary of ICCS History. •It was suggested that IRI be involved and take the lead in organizing this conference. Key questions raised by Brasseur in his presentation at ICC3 in Montego Bay, Jamaica this morning. What are the new products and services that we can offer? 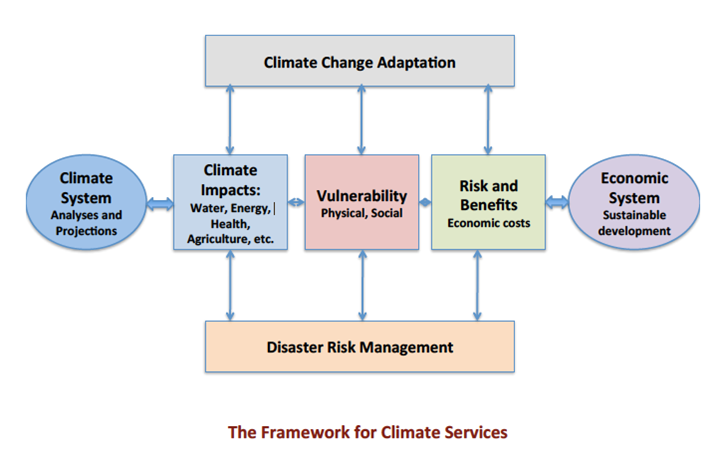 Can we define the attributes of climate services? Can we design a handbook of good practices? Can we bring the corporate world to the table? Can we define new ways of communicating? How can we really engage the socio-economic community in the climate service activities? We’re back with the final day of coverage for ICCS3. Yesterday wrapped up with the Tools expo of the climate Services Partnership. Over the course of ICCS3, some 20 climate tools have been featured. They range from information products and climate data analysis, to decision support and capacity building tools. Though 20 tools have been featured, only four – including the Caribbean Climate Online Risk and Adaptation TooL, were scheduled for special “tools training sessions”. Other tools featured in the special training sessions are the Climate Prediction Tool by IRI, Statistical modeling of malaria in Botswana using the R language for statistical computing by IC3, and Quantum geographic information Systems by NCAR. Professor Michael Taylor of the University of the West Indies, Mona shares three lessons learned in one of three key presentations on this the final day of ICCS3. Excerpts from Prof Taylor’s presentation. The Caribbean Context demands the provision of climate services. …The Caribbean context is one of heightened Sensitivity, limited Scales and small Size. In the Caribbean, climate is a part of who we are. It is an inescapable part of our every day life and so it becomes wrapped up in our very essence and being. We pattern our life around the cycles climate (just think Caribbean agriculture and its dependence on rainfall and temperatures; think Caribbean tourism and its dependence on favourable weather; think the Caribbean water sector –and its dependence on the yearly occurrence of the rain). So in the Caribbean there is a context of heightened sensitivity climate becomes an essential consideration in the region’s pursuit of development. For our sensitivity to climate quickly becomes our vulnerability to climate when the climate changes in ways that we do not anticipate. So it is in a context of heightened sensitivity to climate that climate services finds a role in national and region development. The Caribbean context of sensitivity makes the case for the provision of climate services. But to quickly push the point a little further, if the Caribbean context of sensitivity gives a role to climate services, then the Caribbean context of Limited Scales of resources gives that role relevance. What do I mean? The scale of the Caribbean is such that there is a limitation on resources to execute decisions i.e. for we are limited by our geographical extent, our natural resource assets, our small economic zones, you get the picture. This limited scale of resources means that there are limited Options when it comes to decision making and the very real need to prioritize amongst those limited options. Against this kind of backdrop climate services finds relevance. For knowledge of the possibility of next planting season being wet significantly colours which options should be exercised in the context of the limited resources – Because it provides a reason on which to hinge risk-taking. In other words, in the context of a limited scale of resources climate services provides an additional lens through which to view available options. The Caribbean context of limited scale makes a case for the provision of climate service. And if sensitivity and scale don’t make case for climate services in the Caribbean, then surely the context of small size does. Very simply, the small size of the islands of the Caribbean mean that the Impact of decision made, especially a wrong decision, ripples quickly and pervasively across all areas of a Caribbean island’s existence. Just look back to 09-10 when the lack of decision in the face of an El nino year quickly impacted quality of life, productivity and economic viability of some Caribbean nations as water became a scarce commodity. Climate services has the potential to reduce the ripple of potential climate impact or modify the influence its reach. In this sense the Caribbean context of small size makes the case for the provision of climate services. The Caribbean Context defines the Priorities for the Climate Services that are to be offered in the region. When I distill what I have heard I want to suggest that if that transformative potential is to be fulfilled in the Caribbean the climate service must target certain priorities defined by the context of the region. Firstly, climate services in and for the Caribbean must prioritize being relevant. Climate services must tackle relevant vulnerabilities. Our vulnerabilities are to droughts and floods, extreme warm spells, in the Caribbean context of warm, hurricanes and sea level rise. Addressing these vulnerabilities must be the priority for climate services in the Caribbean if it is to fulfill its transformational mandate. Climate services must tackle the identified developmental priorities of region. They must target and complement the region’s quest for a healthy society, food security based on a strong agricultural sector, diversified economies based on tourism, agriculture, mining and services, a stable energy source premised on renewables, resilient infrastructure and available water. Relevant vulnerabilities; relevant developmental priorities. To achieve its transformational goal, climate services in the Caribbean must prioritize relevance. Climate services in the Caribbean must make as its priority the offering a range of products and tools. There are a wide range of stakeholders in the decision making chain spanning high level political actors, to on the ground sector practitioners and mid level technocrats who generally bridge the divide. Even in its infancy, (and I may be wrong) I sense an emphasis on developing climate services which target the mid level technocrat who it is felt has the competencies to interpret the science based tools and products. I contend that climate services must move swiftly to cover the full range of decision makers, with tools equally targeted to the interest and acumen of the political directorate as well as that of the on the ground sector practitioner. Climate services in the Caribbean must prioritize offering a range of tools covering the range of actors in the decision making process. Climate services in the Caribbean must prioritize building regional resources for this speaks to the sustainability of the service. If the services are to be sustainable they must find a home within the region and that home must possess the competencies to understand, undertake, modify, and disseminate the service. If sustainability is to be attained climate service must become embedded in the operation of an existing regional resource, but this requires targeting regional resources and investing in their capacity to deliver the service. Climate services must prioritize regional resource building. Finally, as I think has been hammered home these past few days, climate services in the Caribbean must prioritize the regional research agenda. It is contextual research that underpins the value of the climate service. It is regional research that also validates, establishes sciences-user linkages, provides justifications and explanations, enables the development of targeted services, aids in building confidence, helps express uncertainties and defining limitations. Climate service must prioritize contextual research. The Caribbean context clearly delineates parameters within which climate services are to be offered. … In as much as climate services can transform, it must always bear in mind its equal potential to deepen the incline or further the unlevel nature of the playing field. As developing nations, inequities abound in many spheres of life and they are sharp and glaring, and divides are deep and often linked to economic means. One area where the inequity is still quite sharp, is with respect to access to information. Climate services offered must always bear in mind that its offerings occur in the context of such an inequity, and great care must be taken to ensure equal and timely access to tools and information generated by the full range of stakeholders who span the information-access divide. Climate services cannot unfairly advantage or disadvantage one set of stakeholders simply because of the side of the inequity divide they fall on. In the Caribbean climate services must bear in mind its potential to further ‘unlevel’ the playing field. In the context of the Caribbean Climate services must also bear in mind that it is not the only game in town. In the pursuit of resilient development, nations in the Caribbean are pursuing multiple options. A logistics hub and agro parks are two of the options seen as key to Jamaica’s transformation to developed status. Climate services in the Caribbean must bear in mind that it operates within this context of a multiplicity of available options for development and therefore must determine how it can best support or integrate with the options chosen by a nation. The very things that make a logistic hub an attractive option for Jamaica – coastal infrastructure, available land and water, smooth shipping lanes, are the very things that climate change will influence. In the context of the Caribbean climate services must recognize that it exists in the context of a multiplicity of other options and therefore must seek to contribute to making the chosen path for development robust and resilient and therein find its relevance. Climate services must bear in mind it is not the only game in town to engender transformation. Finally, climate services in the Caribbean must bear in mind that it is a team that plays the game. Buy in of any climate tool or service ultimately hinges on stakeholder involvement from the very beginning including in tool or service development and deployment. Admittedly up until recently the context of the region has not reflected this understanding. Rather pre-developed tools from else where are often imposed but to little avail. I sense a growing wariness to this approach within the region, and it is not surprising that there is a growing list of potentially useful tools which have caught no traction. Climate services in the Caribbean must bear in mind that they operate within a context where buy-in is engendered through inclusion. Climate services must remember it is a team that plays the game. The Caribbean Context demands the provision of climate services. Our context of heightened Sensitivity, limited Scales of resources and small Size, not only carves out a role for climate services, but gives it relevance and defines the potential  reach of its impact. The Caribbean Context defines a set of Priorities for Climate Services to be offered in the region. The climate services to be offered in the region must prioritize being relevant, offering a range of service, building regional resources and being grounded in regional research. This is necessary if the services are to fulfil their transformative potential. The Caribbean context delineates some parameters within which climate services must operate. It must be conscious of existing inequities, integrate with other development options, and team up with those it intends to serve from the beginning. Bookmark for updates throughout the Conference. By caribbeanclimate in News on December 4, 2013 .